The Japanese know how to do a packed lunch. Bento begins from childhood, where mothers all around Japan make adorable boxes of food for their children to bring as a school lunch. But for the rest of us who aren’t as lucky, packing a visually appealing bento can be difficult. After all, where do you start? Well I’ve got just the guide for you: this is what I’ve learnt about how to pack a bento! Japanese bentos are a work of art - they functionally allow you to bring a balanced lunch to work, and they also look so gosh darned pretty! Bento: it's not a recipe, it's a lifestyle. Find a box/container that you like. Ideally it should have a watertight/airtight seal (to prevent unnecessary messes in your bag), and just large enough to fit your food portions. Here are the magic ratios for packing most bentos: 1/2 carbs, 1/4 protein, 1/4 fruit and veg. Of course, these can be moved around according to preference, but it's a good starting point! Start to think tetris: one of the beautiful things about a nicely packed bento box is the separation. Every component has its place, and every place is deliberate. Try it, it's very zen! 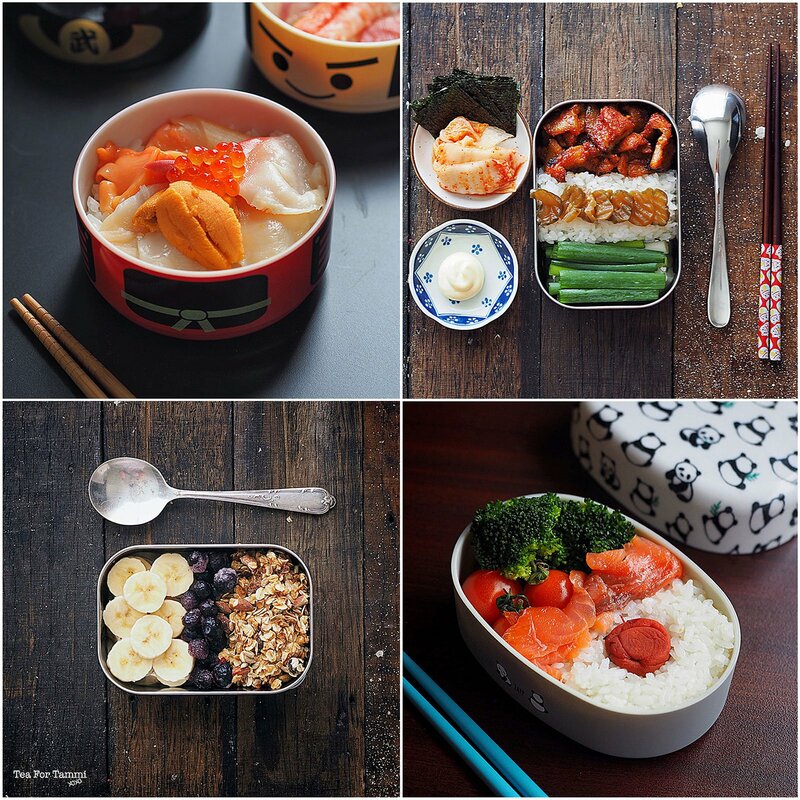 Pack your favourite foods into your bento. *The food shouldn't be too wet, or things start to get soggy and a leaking box is on the horizon! If you're a sauce fan like I am, you should carry the sauced in another airtight container, preferably one that stacks with your first! But wait, there’s more! Simply make this recipe, take a photo and post it to Everten’s Recipe of the Week on their Facebook page for your chance to win a $1,000 Wusthorf prize pack! You can find more details about the competition on Everten’s website. Remember to tag @TeaForTammi or Wusthof Australia on Instagram, Twitter and Facebook, and we’ll share our favourites! We’ll also be Periscoping and sharing a recipe every week, so don’t worry if you’ve arrived here fashionably late to the party. Simply join us 6:30pm (Sydney time) every Wednesday for more delicious food, and follow @TeaForTammi to get notified when we go live!